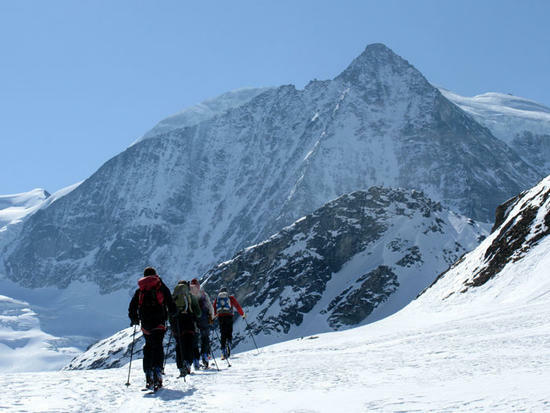 Please refer to this ski mountaineering equipment list for Ski Haute Journeys and other glacial hut to hut tours. This list is intended for guests skiing in guided groups and those without a guide may need extra equipment. Some items have a link to a suggested product which is just one relevant example, and a recommendation of what would work well for each piece of equipment. Many others will of course also be fine and exact choice will depend on what other intended uses each item of equipment will have. Aim to ‘pack light’ and ski with as light a pack as possible…it still won’t be that light! Remember that light + light = heavy and that the only thing that ‘weighs nothing’….is nothing! Clothing needs to be suitable for skinning up hill on a hot and sunny glacier AND skiing downhill on a cold and windy glacier, quite a range! Thus pay attention to the layering system and details for gloves / hats / glasses & goggles for warm and sunny and cold & windy days. Touring Skis fitted with ski touring bindings and set up ready for your own boots. A light to medium weight ski with a waist of around 80-100mm and turn radius of less than 20m is ideal for most tours where a variety of snow conditions will be encountered. Ski Touring Bindings fitted to your skis, ideally with brakes attached. Dynafit are still probably the most popular and are generally light and robust, but take some practice so please ensure you arrive knowing how to use them! Ski Boots designed for ski touring. Lighter boots with a comfortable walk mode are ideal – and usually with holes either side of the toe for working with ‘pin bindings’. Ski Poles can be fixed or telescopic but either way will need to be strapped to your pack for the mountaineering sections. Skins must be fitted accurately to your skis. Modern glueless skins work well if they are in good condition and still sticky! Avalanche Transceiver with fresh batteries. This should be a modern digital transceiver in good working order. Snow Shovelwith a metal blade as plastic blades don’t work! Tough & windproof ‘soft shell’ trousers are ideal for most days touring but see below for an essential addition. Make sure they fit snugly over your ski boots. The minimum amount of technical gear is listed here. If you would like to train with your crevasse rescue gear please also bring a couple of prussiks, micro traction style device, pulley or DMM revolver Karabiner, 240cms sling, 4 screw gate and 4 snap link karabiners. Camera think about making your camera highly accessible whilst skiing / skinning as once in your pack you may not want to get it our and team member may not want to wait for you to do so! 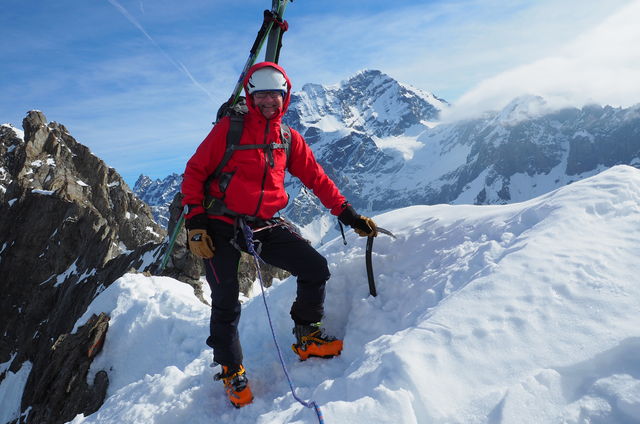 Ski Touring On The Haute Route. Here inbound for the Dix Hut with the North Face of Mont Blanc de Cheilion beyond.